Weird synths build into walls of sound and fall away into a breathtaking panorama of auditory hallucinations; bells chime and disappear into the distance; distorted voices bubble under the surface, before being washed away; and mangled beats, held at arm’s length, burst into view when they can be restrained no longer. This release from Ebauche was originally conceived for a net-series by The Alphabet Set, an Irish collective of artists which helped defined a sound for the Irish electronic scene. 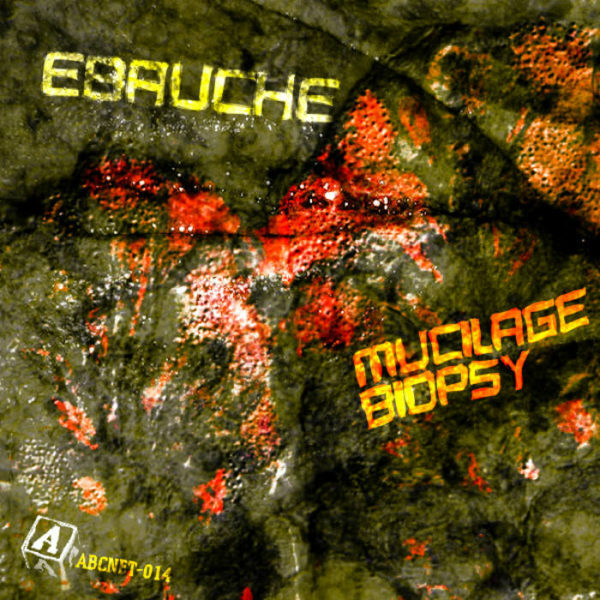 Mucilage Biopsy was entirely recorded in one take in the artist’s studio in a remote location in Longford, Ireland in 2009 and gives a glimpse of a slightly different side to Ebauche’s music, one which has burst forth in a number of his live performances. Whilst the release is contained in a single 40 minute track, there are distinct sections which meld into each other. The introduction instantly grabs attention with chaotic mechanical polyrhythms eventually building to a wall of noise before giving way to much softer and more gentle melodies rebounding in the audio-spectrum. Again these sounds build and compile into another wall of noise before falling apart to be replaced with a rich sonic landscape; glimpses of voices underpin the core sounds just beyond the grasp of comprehension; and discordance appears and resolves and reappears before being left to linger in a hair-tingling chord which entirely encompasses you, constantly morphing and evolving. The final section bubbles up from underneath this moment and reveals and entirely new dark and beat-driven underbelly. Beats tease, a-cappella voices hint at melodies, and rhythm fades in and out until a driving kick coheres the piece into a truly unique piece of densely layered electronic dance music. This digitally re-mastered re-release on Invisible Agent records finally adds this special record to all major digital music services as well as seeing a CD release for the first time.